“Hey I’m a girl, and we like to play dress up.” ~ Charlize Theron. My grandmother Nana gives the best gifts ~some v.practical and easy to use, and some fancy and fun that you can’t wait to wear and treasure. 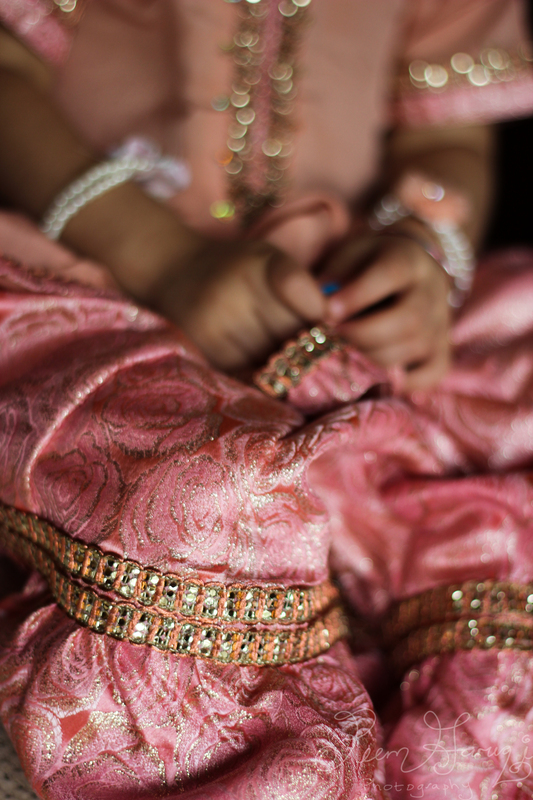 This package fell in the ‘fancy and fun’ category ~ a gorgeous faint pink gharara for Z. 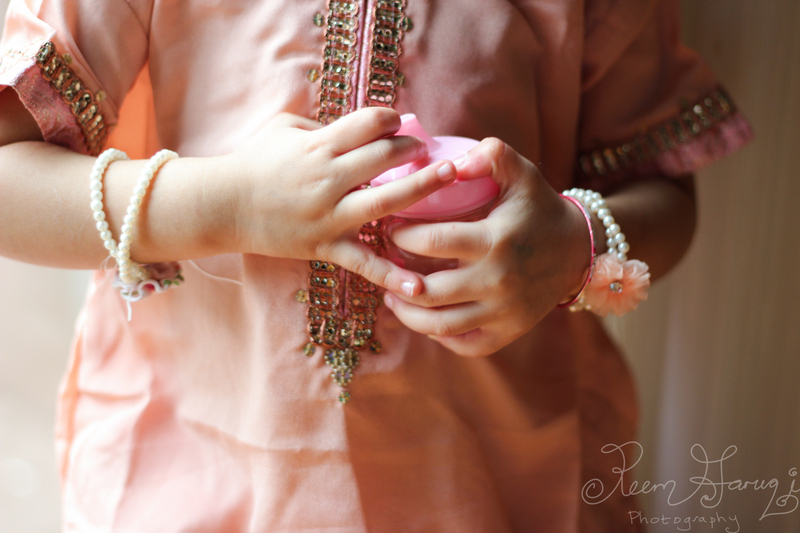 We were supposed to go to a dholki, but didn’t end up going, as alas, Z fell sick with a fever and cough a day before the event, hence the title ‘hopeful hands.’ At least I got some photos of her trying her gharara the day before! 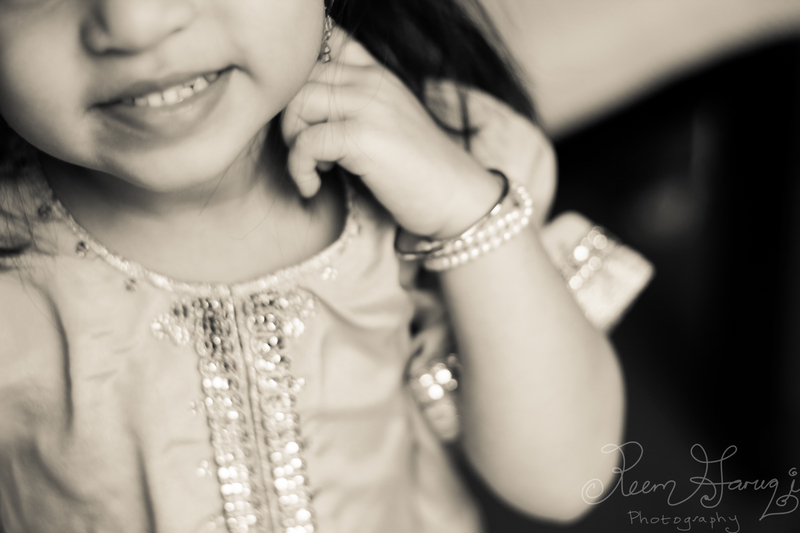 I’m dreading the day she grows conscious of the camera ~ I love natural spontaneous toddler photos. Dress from Behbud – Pakistani Boutique that empowers women! A gharara (Hindi: ग़रारा, (Urdu: غراره‎) is a traditional Lucknowi garment, traditionally worn by Pakistani and North Indian muslim women in the Indian Subcontinent. It consists of a kurti (a short, mid-thigh length tunic), a dupatta (veil), and most importantly, a pair of wide-legged pants, ruched at the knee so they flare out dramatically. The knee area, called the goat in Hindi and Urdu, is often elaborately embroidered in zari and zardozi work. Each leg of a traditional gharara is made from over 12 metres of fabric, often silk brocade (see Farshi Pajama). Dholki: The Dholki or Dholak (Urdu: ڈھولکی‎) celebration takes its name from the percussion instrument Dholki, which is featured heavily during this wedding celebration. Traditionally, many days or even weeks before the actual wedding day, women will gather in the house of the bride at night to sing and dance while accompanied by percussion instruments. Today, this ceremony has also been reduced to a single night of singing and is often combined with Mehndi or Henna ceremony. “Those will have gardens of perpetual residence; beneath them rivers will flow. They will be adorned therein with bracelets of gold and will wear green garments of fine silk and brocade, reclining therein on adorned couches. Excellent is the reward, and good is the resting place.” (Quran 18:31).